Bruce Fitch, Executive Director for BOEC over the past twelve years, announced his retirement late last year. Since then, the board commenced a nation-wide search to find a replacement. From over sixty resumes and a set of intensive interviews, Sonya was determined to be the best fit for the future of the organization. Sonya will start her duties March 5 but will attend the Banff Mountain Film Festival on March 2. Please welcome Sonya to the BOEC community. 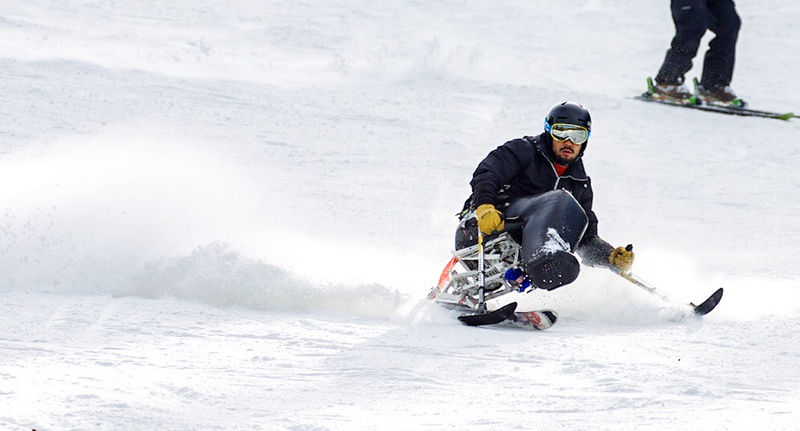 For Marine Corps veteran Manny Jimenez, an above-the-elbow amputee, one sentence sums up why he traveled across the country from his home in Glastonbury, Connecticut, to learn how to ski here in Summit County this week. “A lot of veterans bounce off veterans in their time of need,” Jimenez said. Like many young veterans nationwide, Jimenez has had difficulties adjusting to life after his tours of duty overseas. His time in service included his second deployment, to the southern Afghan agricultural town of Marjah, where he was injured by an improvised explosive device on Aug. 1, 2010. It was at his bedside table where Jimenez and his family met his case manager through the Semper Fi Fund, a nonprofit that provides both immediate financial assistance and lifetime support to injured service members like him. As an organization, the Semper Fi Fund says their focus is helping service members realize there is life post-trauma. “Which I believe played a huge aspect in my recovery to give me that strong mindset,” Jimenez said. “You need a strong support group, especially in the beginning after the traumatic event. Jimenez credits the Semper Fi Fund with instilling a fire inside of him, one that led him to the fund’s sports program, or Team Semper Fi. Just a few months after his injury, he was cleared to run in November 2010, and by January 2011 he was running his first half marathons through the program. Whether it’s Team Semper Fi marathons, triathlons or other events, like this week’s ski and snowboard clinic at Keystone Resort, Jimenez believes these programs are the best way for vets to meet friends who can relate to trying to tackle post-trauma life. Semper Fi Fund athletes and family members pose for a photo with Keystone Adaptive Center instructors at Keystone Resort this week. 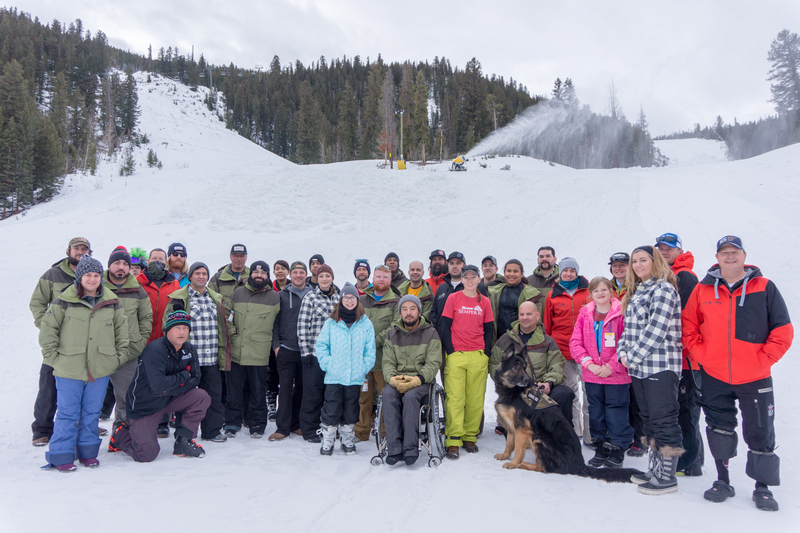 Jimenez was one of 30 service members and their family members to take part in this week’s three-day Semper Fi Fund Ski and Snowboard Clinic. The national not-for-profit teamed-up with the Keystone Adaptive Center and the Breckenridge Outdoor Education Center for the second straight year to help outfit and educate veterans who have injuries ranging from those who are wheelchair-bound, to those dealing with cognitive function disorders from a traumatic brain injury, to those dealing with the wounds of post-traumatic stress disorder. For this week’s session at Keystone, Marine Corps veteran and Semper Fi Fund spokesman Brian McPherson, 30, said more than 50 service members from across the country expressed interest in the Keystone clinic. This week at the clinic, Haley Keller, the program manager at the Keystone Adaptive Center, said 30 instructors and volunteers — including some local veterans — gave their time to help these service members skiers and snowboarders of varying skill levels improve their skills. The Semper Fi Fund shuttled vets like Jimenez from Denver International Airport on Sunday, and beginning on Monday, the Keystone Adaptive Center took special note of each veterans’ injury to outfit them properly to ski for the day. Then on Tuesday, the veterans for the first time conducted a community service project at the Breckenridge Outdoor Education Center, including cleaning up downed trees, removing snow and ice outside the facility and winterizing some of the facility’s equipment. Then Wednesday’s final day of skiing was a free ride day, though the clinic provided above-knee amputee Kyle Cook with the opportunity to also work with Paralympic coaches. As for future fun for others who took part, McPherson himself just relocated to Colorado this past year to ski more often. After his second deployment to Iraq concluded in 2012, the Ohio-native went to a Semper Fi Fund ski and snowboard camp that same year. A never-ever snowboarder, McPherson fell in love with the sport as it became a primary variable that helped him to regain his balance and to live life despite his PTSD from a traumatic brain injury and orthopedic issues stemming from two shoulder surgeries. “It allowed me to grow, post-trauma,” he said. 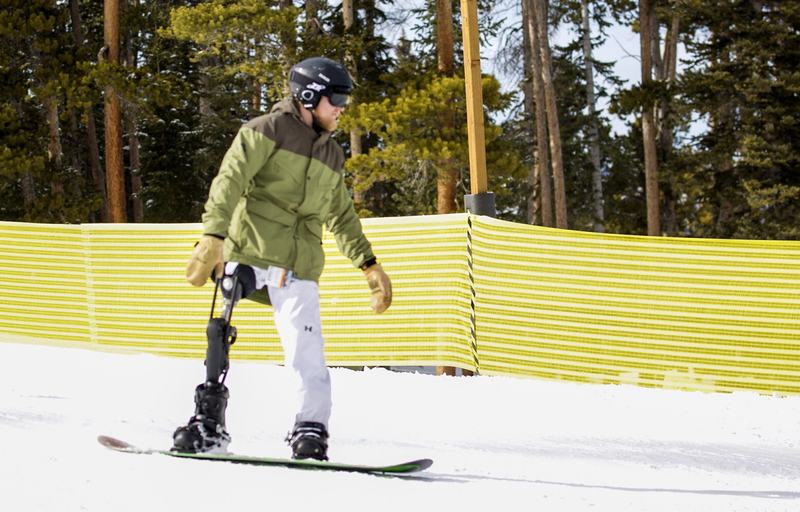 Leg amputee and veteran Kyle Cook snowboards at Keystone Resort this week as part of the Semper Fi Fund ski and snowboard clinic for veterans, put on in conjunction with the Keystone Adaptive Center. With what might be the season’s biggest snow storm yet set to slam into Summit County in time for weekend powder, these days you may find McPherson splitboard snowboarding in the backcountry. His new favorite hobby is to join veteran friends snowboarding at Loveland Pass, and enjoying the hospitality of Summit County locals along the way. “It forces you to be more comfortable in the uncomfortable,” McPherson said. “Backcountry, it gave me what I found in the military, which was a consistent challenge, and the ability to read terrain. After eleven great years at BOEC, I have decided to retire at the end of 2017. I informed the Board of my transition months ago and they will embark on a search to find a replacement, with the hope that a new Director will start at the beginning of 2018. That being said, I am committed to staying at my post until a new Director is found. It has been my privilege and pleasure to serve the BOEC–our staff, interns, volunteers and, above all, our students. What better job than to bring into the outdoors people who may not otherwise be able to experience it. My whole career has been in outdoor adventure education and BOEC has been the capstone, a place of growth and possibility for those we serve. Thank you all for your partnership in this grand project. I fully expect BOEC to continue to grow and flourish. Due to the dedication and hard work of all of you, we have created a strong foundation–financially, programmatically and professionally. We are well set to further our mission for many years to come; and more, new leadership will bring fresh energy, envision new directions and create opportunities that we haven’t yet imagined. Exciting times for BOEC! I will stay connected to BOEC—I am not moving out of Summit. See you on the slopes, on the trail or over a coffee at the Grace! Check out Patrick Tulley’s video of his experiences on BOEC’s Adventures Within MS courses! The creation of seasonal field staff housing will enable BOEC to better attract and retain high quality staff, the most important element in our future success. With the high cost of living in Summit County, seasonal field staff members struggle to make ends meet. The standard in the outdoor programming industry is to provide low to no cost housing. BOEC’s goal is to provide seasonal housing for 10 – 16 core staff in each season, summer and winter. This offers a major benefit to staff, making working for us more affordable and more easily attainable, and would potentially increase tenure. Adaptive outdoor education and recreation requires an enormous amount of gear, from rafts to adaptive cycles to canoes to coolers and stoves. Adequate warehouse storage and preparation space is extremely important to program quality and to the current and future success of BOEC. Improvement and expansion of our support facilities at the BOEC Basecamp will position BOEC for many years to come to deliver the highest quality outdoor experiences possible. Administrative support of our programs is critical to our success as well, requiring effective, efficient and accessible office space. The BOEC Basecamp facility will include modern, functional workspace and IT support for our 10 – 12 administrative staff. BOEC Basecamp will also provide office space to house 2 – 3 other outdoor-oriented non-profit organizations. This shared space increases the collaboration and synergy between organizations with similar missions. Current organizations include Summit Huts and the Colorado Avalanche Information Center. Add a 2,400 sq. ft. third floor to the building to accommodate staff housing for our seasonal staff. Housing will feature individual rooms for 10 – 16 staff members with communal living, kitchen and bathroom facilities, much like lodging at a fire station. Construct a new pitched composite roof to replace the existing deteriorating flat asphalt roof. This improvement will improve the heat efficiency of the building as well as better handle the snow load. Replace entire siding, repair windows and repaint. A new façade will enhance the professional image of our business as well as neighborhood appearance. Window repair will improve our energy efficiency. Replace the obsolete heating system with an energy efficient boiler. Replace obsolete bi-fold garage doors with sliding track doors. New doors will enhance safety and efficiency of the warehouse space. Add an elevator that will access all three floors of the building. Currently, there is no assisted access to the upper floors, not the standard we need to best serve our constituents with disabilities. Add loft storage to the warehouse space. As our operations have grown so has equipment inventory. New lofts will make better use of the high ceiling warehouse space and expand storage capacity by 60%. Add new floor coverings and interior paint; remodel and upgrade bathrooms. A refreshed interior will enhance our professional image and provide employees and guests with a more attractive and usable space. Landscaping and expanding/resurfacing the parking lot. Construction begins in April 2017, with a groundbreaking ceremony on April 26th, 1 PM. The project should be completed by the spring of 2018, in time for the summer 2018 operating season. BOEC Basecamp has been made possible due to the generous donations and in-kind support of many individuals, businesses and foundations. A special thanks to major contributors Peter Joyce and Rockridge Building, Jon Gunson and Custom Mountain Architects, the Town of Breckenridge, Tim Casey, Scott Downen and Columbine Hills Concrete, C&C Swanson Foundation, Breckenridge Grand Vacations/BGV Gives, The Summit Foundation and J.W. Kieckhefer Foundation. A full list of contributors can be found at the BOEC website www.boec.org. On Sunday, April 2, BOEC had the amazing opportunity of teaching Olympic gold medal swimmer Amy Van Dyken-Rouen to ski for the first time since her injury. Check out our very own Jeff Inouye and Lindsey Hahn as they teach Amy how to mono ski. The lesson was featured on the Today Show and highlighted Amy’s amazing will to succeed. Check out the full video. The campers gingerly crawled across the spider’s web of cables, ladders and platforms woven around the lodgepole pines. The wheelchair accessible high ropes course, open last week to participants with the Brain Injury Alliance, ended with a quick zipline trip to the base of the Breckenridge Outdoor Education Center’s Wilderness Campus. BOEC has worked with the Brain Injury Alliance for several years, among several other groups the center hosts each year. A wall length calendar in their office is packed with dates, each one a program for one of the hundreds of agencies they serve. In 1976, the center acquired their current Wilderness Campus, the old Breckenridge town reservoir at the base of Peak 9. An old mining cabin, which used to serve as BOEC’s main operations, still rests on the wooded shore. In 1981, the center began offering a downhill ski program at Ski Cooper. Thanks to advancements in adaptive ski technology, it has little resemblance to the current program. “Back then there wasn’t any adaptive ski equipment,” Fitch said, “just a sled and rope.” Volunteers would tow people up the mountain, and let them “ski” down about 200 yards. Now, BOEC has offered adaptive ski programs to more than 900 students at the Breckenridge and Keystone Ski Resorts. BOEC serves a wide spectrum of disabilities, from those who have lost the ability to walk, to those suffering from PTSD, to children and adults with mental health concerns. They also work with local at risk youth, and provide programs for survivors of domestic violence. In 2015, the center launched a capital finance campaign with four goals: creating staff housing, expanding program activities, increasing their scholarship endowment and upgrading administrative support facilities. To start, the nonprofit is seeking $1.85 million to address these needs. In addition, the center plans to add an elevator to their headquarters, making it wheelchair accessible. They also plan to add loft storage to the warehouse space, increasing capacity by 60 percent. BOEC has already seen several in kind donations for the project, including Rock Ridge Builders and Custom Mountain Architects offering their services in construction. “These were two major contributions right out of the gate,” Fitch said. “The in kind support for this project has been unbelievable.” The center has also seen significant support from the town of Breckenridge and Vail Resorts. The town offered BOEC a 50 year lease for their headquarters and a 25year lease for their Wilderness Campus, both at $1 per year. The Summit Foundation also donated $50,000 to the capital campaign, and Breckenridge Grand Vacations contributed an equal amount. This leaves BOEC with a remaining $250,000 to reach their fundraising goal. Breckenridge Brewery is proud to support BOEC by donating $1 from every tour reservation fee from July through December! The production brewery in Littleton offers public tours Thursday through Monday. The $3 tour reservation fee (of which $1 is donated) includes 5 tastings, an informative tour of Colorado’s 3rd oldest craft brewery, and memorable camaraderie! Those not interested in tasting, or those under 21, are welcome to tour the brewery at no charge. Reservations can be made in advance at www.breckbrew.com/about/tours. Many thanks from the BOEC to Breckenridge Brewery! Starting July 8 through July 31 your donations can go twice as far! This means that Slifer Smith & Frampton Real Estate will match all donations, dollar for dollar, to local Summit County charities up to a total of $15,000! To have your donation to BOEC matched, visit SSFfoundationsummit.org and GIVE starting July 8th! In keeping with the SSF Foundation’s giving philosophy, donations must be direct contributions made to the pre-approved list of nonprofit organizations, which includes the BOEC. The SSF Foundation will match up to $2,000.00 per single organization in an effort to diversify giving.